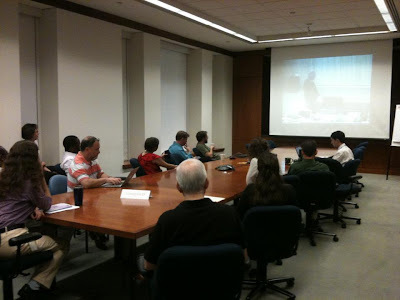 Physics enthusiasts at the American Center for Physics take a break mid-morning to watch the 10 a.m. EDT press conference about the CERN discovery that neutrinos may travel faster than the speed of light. To watch the archived press conference, go here. I would've paid to be a fly on that wall while you guys argued about the claims from CERN. Any chance to share some of those arguments?